These are the products we use and love or wish we owned. Some are already available to you through people we know, like and trust. And we're working on the rest! Will an aerator improve a wine's aroma? Will an aerator improve the wine's flavour? This is a simple and very effective wine aerator. It improves the aroma, enhances the flavours and makes the wine taste smoother. ywine.press tested it on a cheap Rioja, a medium-priced Bordeaux and a funky red from Hungary (Merfelsz Pince's Nectar Sexardique Néró-Medina 2013, from the underrated Szekszárd region). There was no doubt - the wine that passed through the aerator was lifted by several notches. All of the characteristic aromas of the Rioja, Left Bank Bordeaux and rare Néró-Medina grapes were much easier to detect. On the palate, all three wines tasted fruitier, spicier, felt smoother and could have passed for more expensive wines. 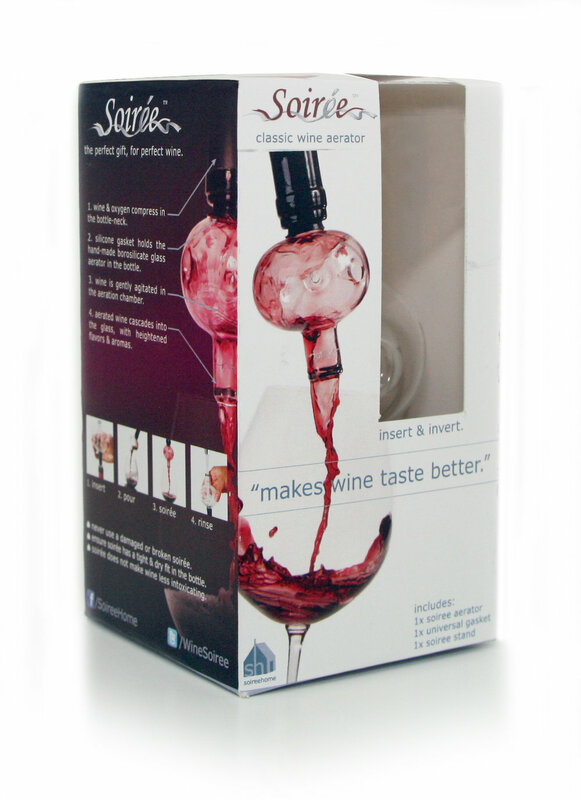 We also like the Soirée wine aerator because it fits directly into the bottle and is easy to use. The five-ring gasket is designed to fit almost any wine bottle. At first we were a little hesitant in tipping the bottle upright, but the gasket stayed firmly in place as the wine cascaded through the borosilicate glass bowl, sucking up oxygen as it went. 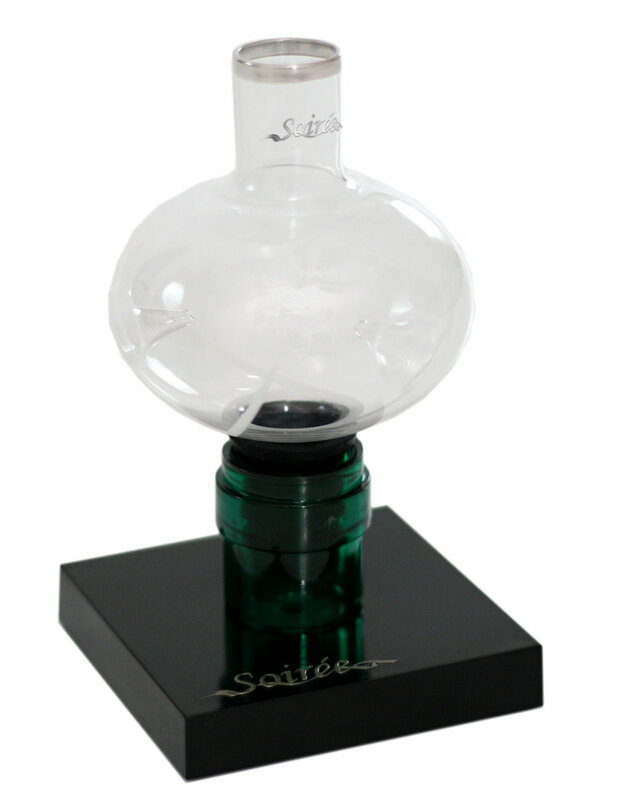 Made in California’s Napa Valley by SoireeHome, it decants one glass at a time. Our preferred method of helping a wine to breathe is to give it mouth-to-mouth resuscitation. The next best thing – and the quickest method – is the Rouge 02. How often have you found that a bottle of red wine tastes better the day after it’s been opened? The Rouge O2 does the same thing, in less than a minute. It’s an electronic breather that does away with the need to decant wine to get the best out of it. Even if you don’t believe it improves the wine, it’s a fun party game to see if friends can spot the difference between a glass of wine that hasn’t been aerated and one that has. We tested the Rouge 02 on a bottle of one of our favourite reds, the 5 Elemente 2013 from one of Moldova’s top producers, Equinox. After pouring a glass for control purposes, we inserted the Rouge O2 into the bottle. It only goes in halfway to prevent disturbance to the sediment. Once inserted, the start button on the top was pressed and the wine bubbled away for about 36 seconds before the device stopped automatically. This, says the British designer, Peter Dunne of CellarDine, ensures the correct breathing time. The Rouge O2 works on 2 x AAA batteries which, Mr Dunne says, should last for more than 230 bottles. He launched the product in 2004 to reduce the time needed to properly aerate a full bottle of red wine from 1 hour to less than 1 minute. When we poured a glass from the aerated bottle and compared it to the first glass, we didn’t notice much difference in the aromas but the aerated wine did taste smoother and fruitier. The tannins had certainly been softened. The gadget was also very simple and fun to use. You can also use it to aerate one glass at a time by sticking it in a glass rather than in the bottle and pressing the top button again to stop it after a few seconds. The Rouge 02 was updated in 2015 and given a sleeker design. 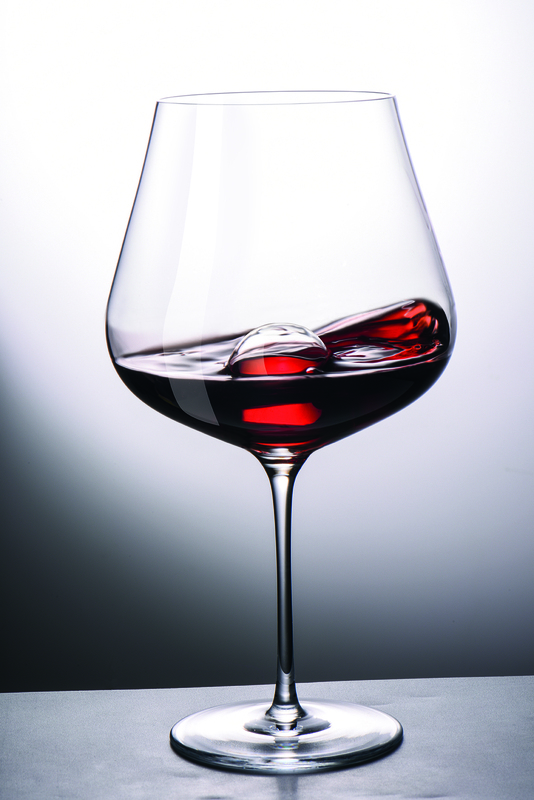 While so many glassmakers have been concentrating on the shape of the glass, Bavarian manufacturer Zwiesel Kristallglas has been looking at what’s in the glass. After collaborating with Swedish designers Bernadotte & Kylberg, it has produced the Air Sense glass with its own little decanting sphere inside. German sommelier Alexander Kohnen told ywine.press that, with these glasses, you don’t need a decanter. Another reason we like these lightweight, mouth-blown glasses - they can go in the dishwasher. It was hard for us to tell how much difference the decantation sphere made as we used them to taste one of Germany’s top Pinot Noirs, the 2011 Recher Herrenberg from Weingut Jean Stodden. If we don’t finish a bottle of wine, we call the doctor for a check-up. Then we insert this silicone wine saver (in the bottle). The AntiOx Stopper from top Spanish wine accessories manufacturer Pulltex slows down the oxidation of wine. Previously we used a pump to keep the wine fresher for longer but it wasn’t as effective as this. The salesman said the AntiOx would keep the wine from an opened bottle fresh for up to 10 days. We couldn’t wait that long – we had opened one of our favourite reds, the 5 Elemente 2013 from one of Moldova’s top producers, Equinox. We had another glass after four days and finished the bottle on day eight. The wine – a silky smooth blend of five grape varieties, including the local rarity, Rară Neagră) – was still very drinkable (thankfully! ), but it had lost some of its lovely fruit aromas. Maybe the built-in carbon filter that absorbs the acetic acid caused by oxidation also absorbs some of the aromas. One feature that proved handier than we thought it would was the day marker. It’s easy – well, it is for us – to forget when you opened the wine and how long you’ve resisted the urge to finish it. Well done me, eight days! With a gentle push, Vacu Vin’s new carafe spins round, turning and rolling the wine inside to help it ‘breathe’. 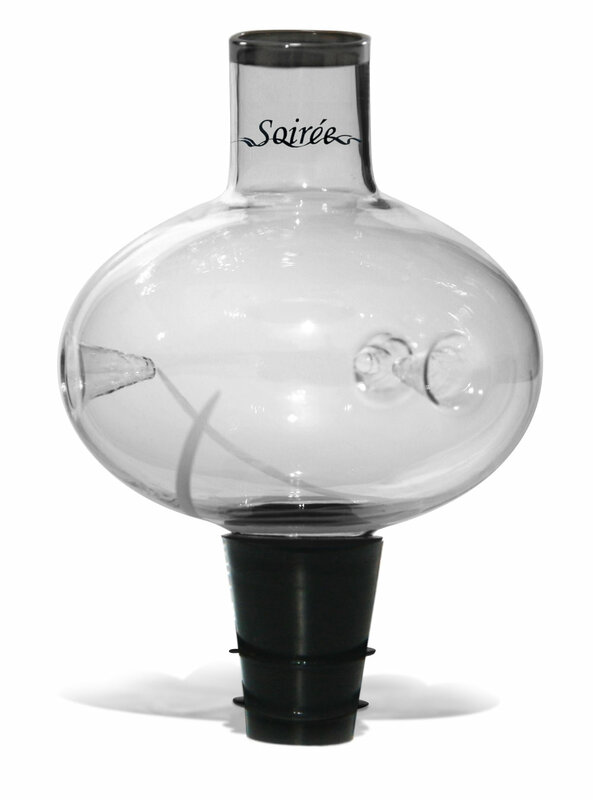 The ‘Swirling Carafe’ is described as a ‘functional eye-catcher’. It comprises a glass decanter with a recess in the bottom that helps it stay in place as the bottom, made of compressed cork, spins. It makes a great centrepiece and talking point at dinner parties with everyone wanting to have a spin. But we are yet to see how much the swirling motion improves the wine but, in theory, it is mimicking what wine connoisseurs do in their glasses before drinking. One other reason why we like Vacu Vin products is that they are made in Europe by the International Innovation Company, which employs 150 mentally or physically disadvantaged people. 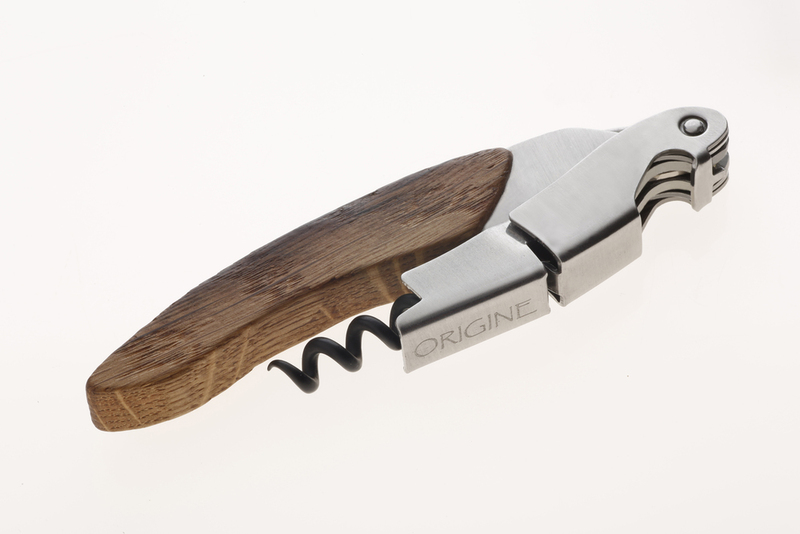 No two pieces are exactly the same, so each corkscrew has its own stains and marks – its own character. The Origine is designed by Ligne W’s founder, Sébastien Lézier. It features a non-stick coated screw, high-grade stainless steel parts, serrated foil cutter, and bottle opener. 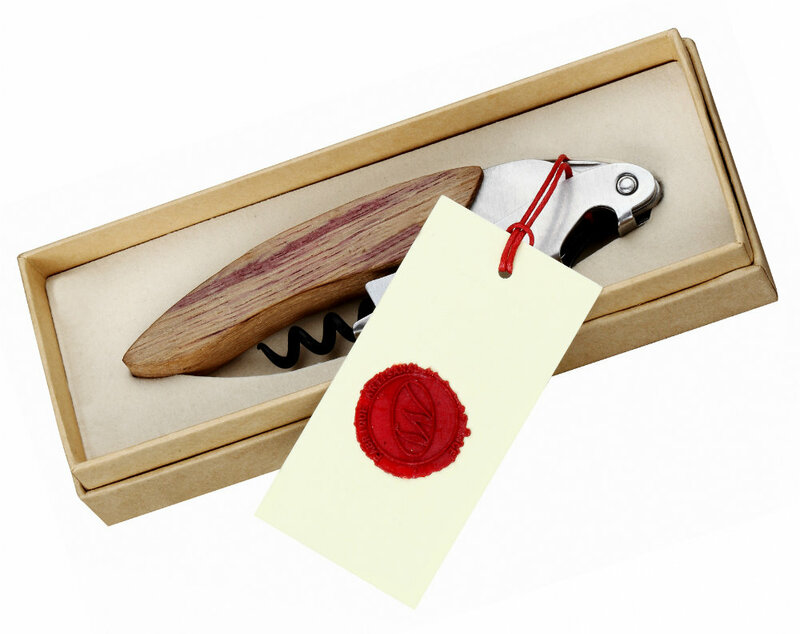 It makes a smart gift too, as it comes in a rustic, minimalist presentation box, with a wax seal and a message describing the process behind the Origine. There are two finishes to choose from – wax or the darker linseed. Riedel Crystal celebrated its 260th anniversary by launching the Ayam decanter, which takes its shape and name from the world’s most exclusive and coveted breed of hen. The elegant and impressive hen, which is indigenous to Indonesia, inspired Maximilian J Riedel, 11th generation CEO and president of Riedel Crystal, to create “something exceptional and entirely new” to mark the anniversary. 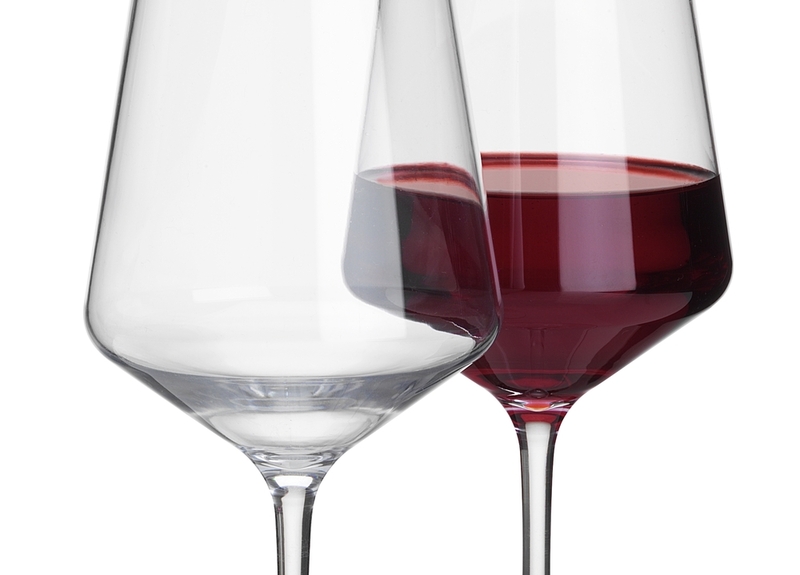 As with all of Riedel’s designs, the functionality is important too. With the Ayam, the wine is aerated both when it is poured into and from the decanter, significantly reducing the time needed to “open up” the wine. You can tell it is working by the lovely gurgling sound. The other unusual feature is that this perfectly balanced mouth-blown decanter can be hung up by its tail. To mark Riedel’s 260th anniversary, ywine.press is showing the Austrian company’s most amazing crystal glass decanters. All are handmade. Most are available to buy from here. 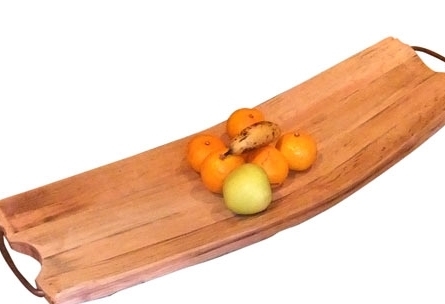 Benguela Trading manufactures cheese boards, fruit bowls and garden furniture from used wine barrels. The pieces are made in South Africa and have some staining and aromas from the red wine that was once matured next to these staves. Another decanter we like is this one from Danish-owned design company Eva Solo. The base will keep wine chilled for up to four hours, as it features a removable cool element which is kept in the freezer until showtime. Sommelier Christian Aarø told us this decanter would particularly benefit “a rich Chardonnay”. The mouth-blown glass carafe itself has an integrated funnel, which is perforated with small holes. As the wine runs through these tiny holes and down the inside of the carafe, it is gently and effectively aerated, while the large surface area of the carafe allows the wine to oxidise further as it chills (or is kept cool). The carafe, designed by Claus Jensen and Henrik Holbæk, is 100% drip-free, and any condensation from the chiller element collects in the base, preventing both wine and water from dripping onto the table. All parts are dishwasher-safe. Eva Solo also offers a range of glasses and wine accessories. Why shouldn't your water glass and carafe be as beautiful as your wine glasses and decanter? Buy these products direct from Michael here. Artisan glassmaker Michael Schwarzmüller makes these stunning glasses, carafes and vases for top-end restaurants in his home country, Germany. They’re not cheap and they’re not perfect (as the rims are cut by hand rather than machine), but they have a beautiful quirky quality. Each glass takes about 15 minutes to make. Coravin has launched its improved and more stylish Model Two. In case you’re not familiar with the original one, it’s the gadget that has revolutionised wine saving as it allows owners of expensive bottles of wine to pour a glass of wine without pulling the cork or ruining the rest of the bottle. The Coravin system inserts a fine needle through the cork and then injects inert argon gas into the bottle. The pressure of the argon pushes the wine through the needle, whilst preventing any oxygen from entering the bottle. • A streamlined, modern design with brushed metal accents in dark graphite. • A thin wall needle that pours 20% faster than the original needle while still not damaging the cork, and also locks into place to prevent leaks. The faster-pouring needle from the Model Two can be bought separately and used on the original Coravin. • New L-shaped ProperFit Clamps with textured grips, making them easier to squeeze and ensuring a secure hold on every bottle. • New ‘Capsule Cup Load Cell Technology’ provides a tight seal every time between the device and the gas capsule for leak-proof installation of the capsule. The Model Two comes with two complimentary argon gas capsules, a Coravin wine bottle sleeve, a storage base and a needle-clearing tool. Price is £279. The original Coravin Model Eight is still available for £249 but we think the improved features make the slightly more expensive Model Two a better buy. We love the Stina Plavac Mali Majstor Barrique from Croatian winery Jako Vino – the red wine and the all-white, simple, stylish label. This is a label that divides opinion. The embossed lettering can be difficult to read, but the label is meant to be symbolic of the limestone blocks (stina) quarried on Brač island, where the renovated former co-operative winery is located. It is said that the blocks have been used in great works of sculpture and architecture, including the White House in Washington DC. The idea behind the textured white paper label is that it is a blank sheet that invites art. Even, to some, the drips of red wine that, for us at ywine.press, ruin the label can be seen as some form of folk art. But what better bottle to test Vacu Vin’s Wine Server Crystal? Here you can see the results after an evening of entertaining using two bottles of Stina Plavac Mali Majstor Barrique. One bottle was fitted with the Vacu Vin pourer and one wasn’t. The clever design clips into the bottle, prevents drips and returns any excess wine back into the bottle. It’s made of plastic but the high-gloss transparent material makes it look a little like crystal glass. It fits most bottles and our little test shows it works. The bottle on the right did not have the pourer fitted while pouring the wine; the one on the left did and although the wine was poured by several different people, there were no drips. We always use it now for red wine. This is the glass the ywine.press team uses at home. The look divides opinion. But the shape ensures the wine’s full character and potential can be revealed. Firstly, the clear glass reveals the wine’s colour. The wide bottom allows for precise swirling without the risk of spillage. The upper rounded section which narrows as it reaches the lip concentrates the aromas. 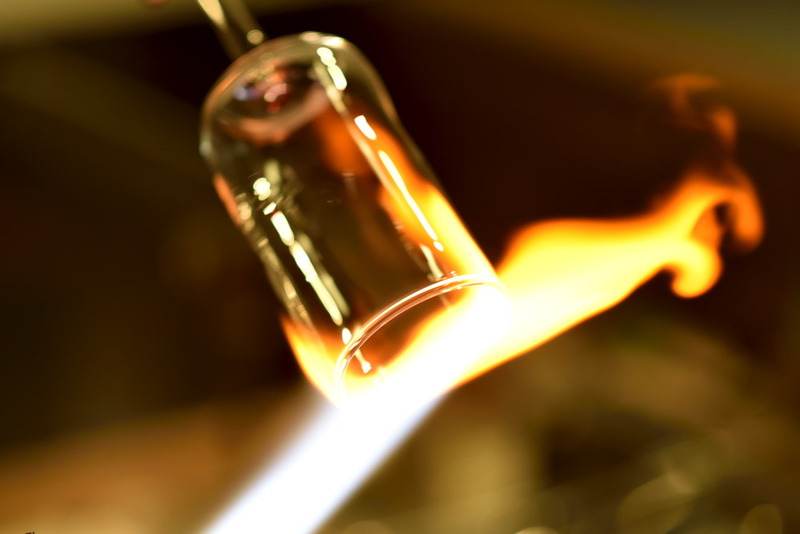 Tests by Gerard Liger-Belair at Reims University show the glass offers “an aromatic density up to 50% higher than any other standard tasting glass”. The flavours are enhanced by the glass’s fine rim. Master sommelier Gerard Basset, who consults for the French manufacturer Lehmann, calls it a “genuine flavour enhancer”. The range, called Oenomust, is designed by Gerard Lehmann who has more than 30 years’ experience of designing glassware in the Champagne region of France. What wine-loving dad wouldn't want this as a gift? 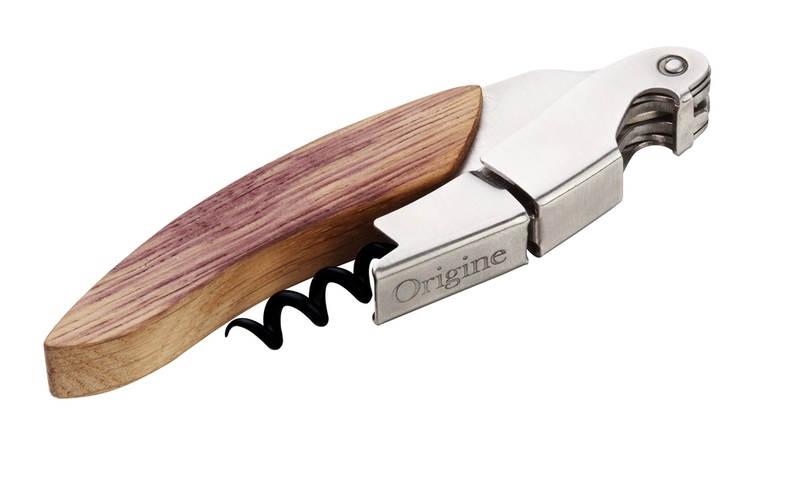 The perfect gift for Father's Day – Pulltap's Toledo corkscrew from Pulltex. It has very stylish rosewood inlays and a double-lever action that makes pulling corks simple. The spiral has a non-stick coating and the stainless steel sleeve incorporates a little blade to cut the foil. We also like the Spanish manufacturer's ice buckets and chilling bowls, which come in a choice of styles, with and without handles, and cover a spectrum of colours. The ultimate decanter – Riedel’s Mamba Double Magnum is Maximilian J Riedel's homage to the 200th anniversary of the birth of Josef Riedel the Elder (1816-1894), the sixth generation who ran this family company during the golden age of glassmaking in Bohemia. It's a larger version of the highly-praised 2011 design, the Mamba decanter, but is in double-magnum format. Making it was incredibly difficult so raise your glass of wine to glassblower Jan Kocek, who blew it by mouth and shaped it by hand. It’s available in two colours (black or green) in a limited edition of 260 pieces per colour. 260 because the company, now based in Kufstein, Austria, is celebrating its 260th anniversary this year. Handy 3-in-1 wine tool – The Corkcicle One chills the wine, aerates it and makes pouring less messy. It will keep your white wine at the right drinking temperature for 45 minutes to an hour. And, as you pour the wine out through the spout, it will mix air with it to open it up - which means releasing aromas and flavours that may be deeply embedded in the wine. The other thing we like about this stainless steel gadget is that you don’t have to remove it before pouring and there is also a stopper on top to help keep the wine fresh between pours. The thermal gel that does the chilling is the same one tried and tested in the original Corkcicle. It comes in a glass case for storing in the freezer. This is a very portable and convenient aerator – The Vinturi Red Wine Aerator. The Vinturi Red Wine Aerator is used to aerate one glass of wine at a time, in the time it takes to pour the glassful. We tested it on a Merlot from Chile and a red blend from Moldova. The aromas and flavour were slightly different between the non-aerated and aerated wines, but it wasn’t improved for everyone in our six-strong judging panel. The thing we all liked, though, was the noise it makes as the wine goes through the aerator. It’s a very impressive way to serve red wine and creates a great talking point at dinner parties: Can you spot the differences and, if so, has the air rush improved the wine? It is a very stylish device, made from acrylic with an easy-to-grip silicone body. It comes in a smart box with a no-drip stand for keeping wine stains off the table and a filter screen to hold sediment and rogue bits of cork. How it works: Place a glass under the Vinturi and pour your wine through the opening. Its internal design creates an increase in the wine’s velocity while simultaneously decreasing its pressure. This difference in pressure draws in “the proper amount of air”, which mixes with the wine for “the right amount of time”, and, in theory, delivers an improved bouquet, enhanced flavours, and a smoother finish. The Vinturi Red Wine Aerator is based on Bernoulli’s principle, which states that as the speed of a fluid increases, the pressure within it decreases. In other words, it accelerates the natural blending of air and wine. It’s very easy to use and makes for a stylish way to serve red wine at a table. It may work better with older red wines. Now you can dine out in style without worrying about breakages. Looks are deceiving - two of these aren't real glass! The new Savoy ‘glasses’ from Flamefield are ideal for parties and picnics as they are made of unbreakable polycarbonate material but they look and almost feel like the real thing. The shapes of this polycarbonate glassware are achieved by a specialised blow mould process. The range includes Champagne flute, red wine goblet, white wine goblet and short tumbler. All come in 2-pack gift box. Navigate's new Atlantic recycled glass-effect range includes bowls, pitchers, tumblers, wine glasses and a 7L drinks dispenser. It looks and feels like glass but is virtually unbreakable. The ‘artisan’ look taps into the ongoing trend for handmade, artisanal-style design and coordinates with Navigate's new Summerhouse Atlantic outdoor tableware and accessories. We don't like coloured glasses for serious tasting, but we make exceptions when we want to add a little colour to our picnics and barbecues. These glasses are part of Ella Sabatini's new Tutti range. The range consists of a wine glass and flute in assorted blush colours. We will give an honest opinion. It's a work in progress, so check back again soon for more fantastic glassware and wine accessories.